When they were surcharged in 1985 and forced to pay £126,947 between them the 31 Lambeth Councillors launched a huge fundraising campaign to cover both the surcharge and the court case for their appealed. This pamphlet, with photos provided mainly by Lambeth NALGO member Dave Stewart, covers some of the key events, protests and personalities of the dispute. The Nuclear Dawn mural. Painted on the side of Carlton Mansions by Brian Barnes, Dale McCrea and people who lived in the building. Barnes painted a vision of nuclear death astride London, a mushroom cloud in the background, whilst politicians such as Margaret Thatcher and Ronald Regan are safe in a bunker. A dove becomes the CND peace symbol. 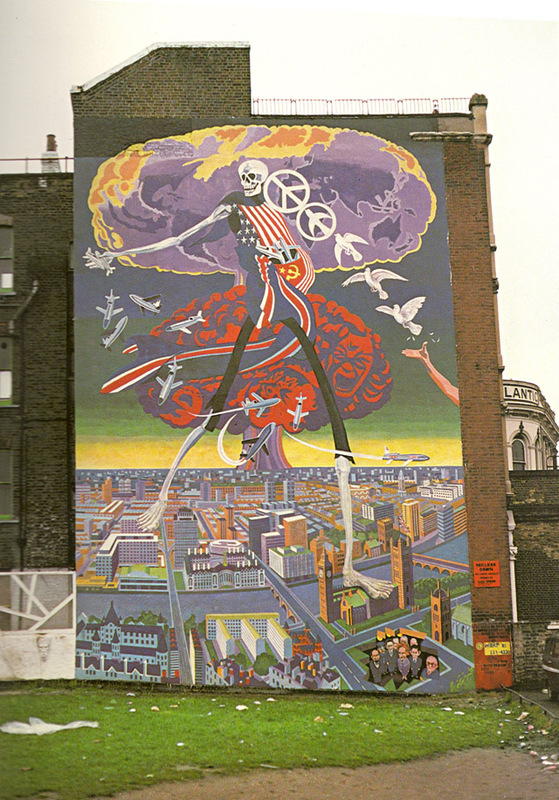 Finished in 1981 the mural was part funded by Lambeth Council as part of its ongoing effort to highlight the danger of Mutually Assured Destruction in the event of a nuclear war. For information can be found here.